Please click on the best service for you in column 1 for ordering and pricing details. The information below elaborates more on each service. We’ve helped others in your job / sector. We can help you too. The best guarantee in the sector!…. First Job CV: For young non-students. Student/Graduate CV: This service gives students and graduates a distinct advantage getting onto the first important step of the career ladder. Mid Career CV: Helping those in mid career land better jobs. Manager CV: The higher the career rung, the stiffer the competition. We give our manager clients the advantage. Senior Manager CV: We have an excellent record helping senior managers in all sectors achieve their career goals. We can help you too. Executive CV: Standing out at top level is extremely difficult. We’ve been helping executives and directors do just that for years. Career Change CV: Career change CVs are the hardest of all to write. Since they need to be very different to your original they need more creativity, lateral thinking and multi-sector experience. Our consultants give you all that and more. 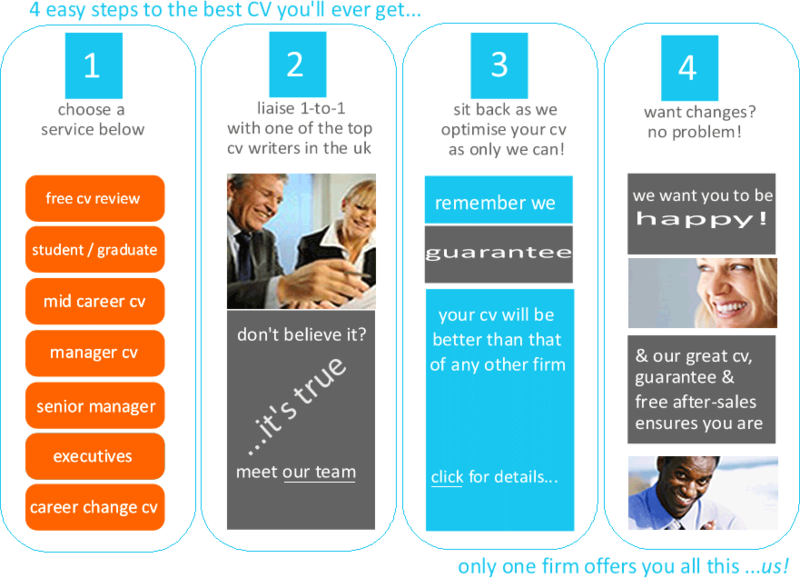 How we go about creating the best CV you will get anywhere, at any price. Clients come to us from all around the world, frequently by word-of-mouth recommendation. This just doesn’t happen by sheer chance. On the contrary, it only happens because we get results – real results, for real people – just like you. When you apply for jobs there’s usually only one winner per job on offer. Second best frequently just isn’t good enough. When it comes to CV writing, our mentality also revolves around the fact that second best just isn’t good enough. We therefore sell your skills like no other company can (or does), and it is therefore no fluke that we consistently achieve exceptional results for our customers. Firstly, we go out of our way to ensure that we are working to help achieve your own personal job/career goals. This means your consultant liaising with you to find out exactly where you want to head, and then working with you to help you get there. It’s a two-way iterative process that is straightforward and tried and tested. Moreover, your friendly consultant will be able to guide you every step of the way. Talking of consultants… we have the most stringent recruitment policy in the CV writing sector. No one gets to write for us unless they are customer-focused, intelligent, well qualified, highly creative and exceptionally talented. Such writers are very few and far between, and we are fortunate to have the very best writers in the business working for us. Please meet our team. We say ‘fortunate’, but strictly speaking that isn’t quite accurate. Some of our consultants have previously worked for other companies, but their professional pride was such that they wanted to work for the best, and do more for clients, so they applied to us – even if it meant going through the rigmarole of our arduous selection procedure, our daunting tests and even learning all about top quality CV writing from scratch – because our methods are not only different, but also much more demanding and harder to master than conventional curriculum vitae writing methodology. Talking about methods… we work to real sales and marketing principles rather than simply tweaking your original CV, filling in blanks on a template, or using decade-old, outdated CV writing formulae. The CV we write for you should not only say more, in fewer words than your original CV, but also say more in fewer words than any other professional company. Not only that, but it should be more focused and better optimised for your target job, and written with your own goals/circumstances as well as the target employer in mind. It’s impossible to do all the above properly just by tweaking things or using flawed conventional methodology. Consequently, we usually have to go back to the drawing board and recreate your CV bottom up from scratch. Naturally, this takes more time, thought and effort on our part – but ultimately it helps our clients get the best CV that they will get anywhere, and it helps give them the tangible advantages over their competitors, giving them the best possible shot at better, well-paid jobs. As you can see, it is no coincidence that we get outstanding results for our clients. We have helped your competitors – now it’s your turn to benefit! Choose the best service option for you below.